: Press left or right to steer your car between lanes or around turns in either direction. : Press and hold up to activate your car's turbo acceleration. It cannot be used below 90 km/h. : Press the down direction during the race to cycle through the available music. You can choose between three different tunes, or no background music at all. : Press and hold the A button down to step on the gas and accelerate your car. : Press the B button down to step on the breaks and slow your car down. If you press both the A and B button together, brakes take precedence over the gas peddle. : Press the select button to choose between the two available cars during the car selection screen (shown right). Press select during the game to toggle the 3-D (red/blue) mode on and off. 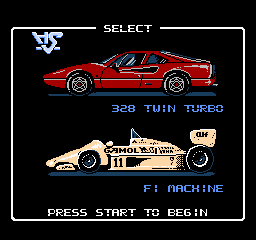 Before you start a game, you are given the chance to choose between a Ferrari 328 Twin Turbo (shown left) or a Formula One racing vehicle (shown right). The fact of the matter is that there is no difference between these two vehicles besides the way they look. Both car perform identically to one another. They both accelerate at the same rate, and they both have the same maximum speed, 255 km/h. The only difference that choosing one over the other has on gameplay is the opponents that you drive along side during the race. If you choose the Ferrari, you will race against a variety of other car models which change from one course to the next. If you choose the F1 machine, all of the cars that you encounter along the race will also be F1 machines. Even when computer controlled, there is no difference between the F1 machines and all the other vehicles; they behave in exactly the same manner. Throughout the game, the dashboard of your vehicle will be displayed at the bottom of the screen. It shows you information about your current race conditions. At the very top is a colored gauge which represents your engine's RPMs. Since both cars contain automatic transmissions, you never have to worry about switching gears or redlining, it's simply there for effect. Immediately below that is your speed. You cannot go any faster than 255 km/h, so any attempts to accelerate or turbo beyond that will have no effect. Below your speed is a gauge which indicates your progress along the entire course. The S stands for "Start" and the G stands for "Goal". The more that the triangles light up from left to right, the closer you are to the completion of the course. On the right side is your score. Your score is cumulative across each course, and is determined by how far you travel, and how fast you travel. On the far left side is the timer, and probably the most important indicator during the race. This timer indicates how much time you have to complete the current leg of the course; that is, the time you have to reach one of the three checkpoints or the finish line. If you run out of time, your gas pedal will disengage, but your car will still move forward on its own momentum, slowly slowing down (unless you hit the brakes). If you manage to cross a check point before your car comes to a complete stop, you will be awarded for the accomplishment with more time, and your gas peddle will reengage, allowing you to continue racing. This page was last edited on 2 May 2012, at 10:39.